I love venturing outside of my regular Mt Hood area and finding unique, beautiful locations. This place definitely did not disappoint. Wow. It is SO pretty at Moulton Falls Park. 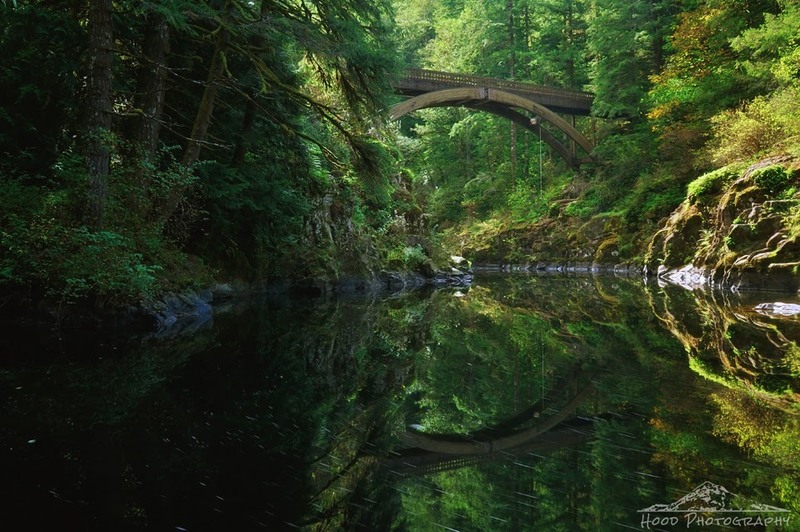 Located about 15 miles outside of Battle Ground, Washington, the 387 acre park is amazing! The lush wilderness runs along the Lewis River, and the leaves are just starting to change. Once you reach the river, you come to this gorgeous footbridge crossing. I took the approximately 10 second long exposure to show how slow the water travels along this stretch of river. However, about 1/4 mile downstream is the very violent Moulton Falls, which I will post later this week. Visit if you can, because it is so worth it. Nice reflection. I've been by this park on my way to hike Silver Star Mtn but have never stopped to look around. I'll have to check it out when the leaves start turning. I do like that reflection of the bridge, looks like a beautiful peaceful spot. Such scenic reflections. Awe inspiring beauty in this setting. Very pretty scene, so luck and green. Lovely photo. So very beautiful. Love the colors! Beautiful greens = a lovely spot. Wonderful merging of reality and reflection. Wow! Such a stunning photo!